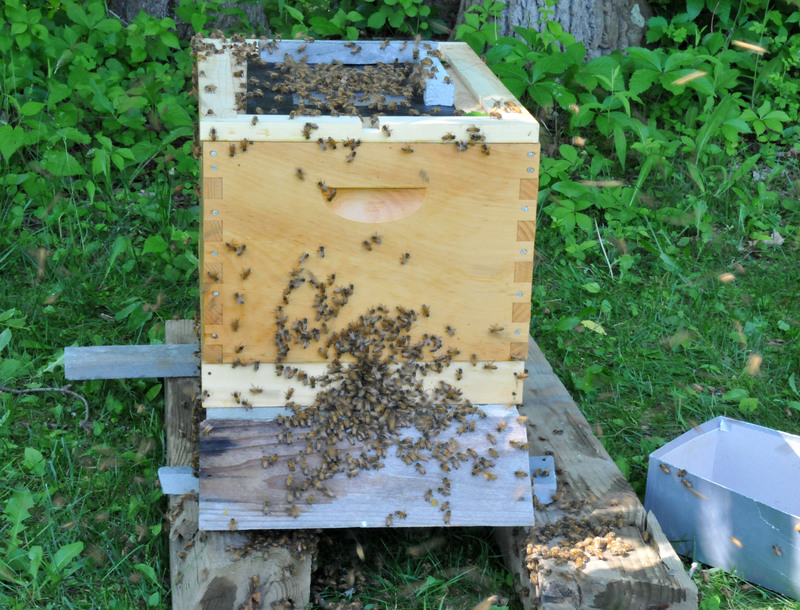 The first hive swarmed again on the morning of June 7. This is the third time within a month for this hive. I think I should start naming the hives since I’m going to have five of them, and maybe more if they keep on swarming. I didn’t expect to have this many hives since our property is not big, though we have plenty of woodland nearby. I did my usual walk around the garden in the morning when I encountered the swarm. First I just saw a few bees flying on top of the Wisteria but when I inspected closely I realized that they had already balled up on the branches. I grabbed the same old cardbord box I used to catch the previous swarm, water spray bottle and tried my best to set up a base to put them in prior to disturbing them. I didn’t have a full set of hive equipment left and the new order was still in transit. Luckily, I still have one old base that I didn’t have time to sand and coat, a winter inner cover, a regular cover and an empty super. I sealed off an opening in the middle of the winter inner cover and set it on the old base as a bottom board and then put an empty super on top. I closed the middle opening of a regular inner cover with a screen for air flow to keep the bees from getting in or out, and to get it ready to be used as an inner cover. Then I woke my partner in beekeeping up to help me cut the Wisteria branches down. 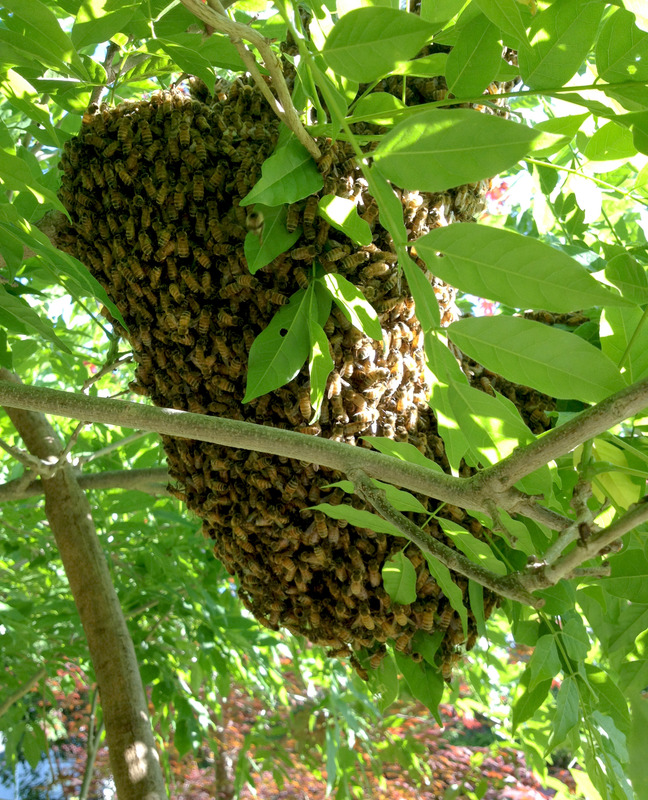 This swarm was the easy one because it balled up on lower branches that we could cut and drop into the box. The fun part was shaking the bees into the empty super. The majority of them just dropped in but there were still plenty of them flying around. Once I saw that some bees were trying to get inside through the top screen, I knew I had the queen in there. I opened the plug at the bottom to give the outside bees access and it was like a vacuum sucking the bees in. With a screen on top, the wandering bees can smell the queen and try to get in. As soon as I opened the bottom entrance, they just poured in. The equipment came in a few days later. We opened both boxes that the swarms had settled in and put frames in, then changed the base and cover. Both hives had already built large comb attached to the inner covers and were somewhat annoyed as we replaced their furnishings. I had linen pants on and managed to get stung a couple of times on the legs. They have settled in now but the weather has not been on their side in the last couple of days, pretty damp, cool and cloudy. I’m debating whether I should feed them. 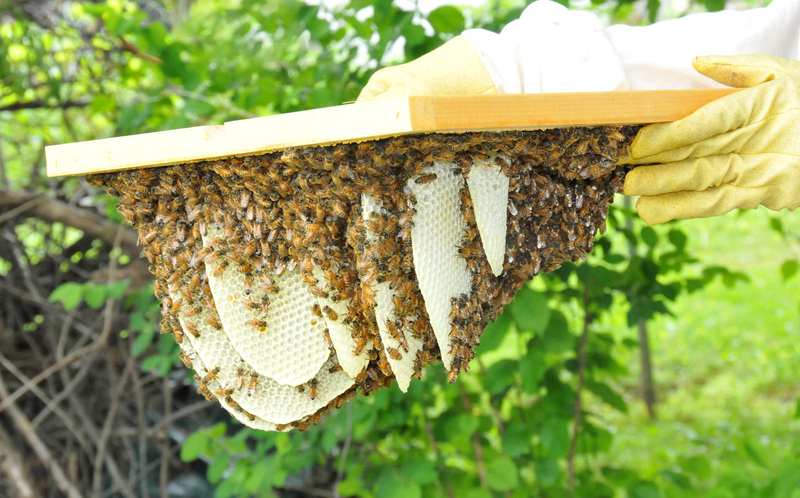 Hive 4, from the second swarm on June 3, has built comb under the inner cover with some honey and pollen. I felt so guilty having to scrape them off. Hive 5, from a swarm on June 7, has also built up comb but with less nectar and pollen. I couldn’t believe how fast they can build. This is only three days work for them. The good news is my lovely neighbor has offered to house one of the hives providing I look after it for her. You may single handedly revive the bees in N. America. It’s an interesting season for bees. I think maybe because they came out of a bad winter and wanted to insure their survival so they proliferated in abundance. Didn’t expect to have this many hives in a short time. Of course I would love to be able to revive the bees of North America, small start that this is. But I think I just managed to save a few. They really are fast builders! I’m impressed. Yes. Everyone I show the photo to is as surprised as I after 3 days of comb building. Now, if only I could find employees this productive. …Naw. Never happen.